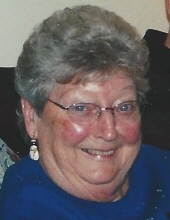 Cook, Joyce J. - Age 85, of Grayling formerly of Grand Blanc, died January 12, 2019. Funeral services will be held 11 AM Friday, January 18 at Sharp Funeral Home and Cremation Center, 6063 Fenton Road, Flint. Visitation will be 4-8 PM Thursday, 10 AM until the time of the funeral Friday. Interment at a later date at Evergreen Cemetery, Grand Blanc. Those desiring may make contributions to the American Cancer Society. Joyce was born April 29, 1933 in Clio the daughter of Elmer J. and Frances J. (Wieger) Wheeler. She was a graduate of Mandeville High School. She married Philip Cook on September 26, 1953 in Flint. She had worked for GM Ternstedt for a few years before starting her family. Later she worked for Grand Blanc Printing as a Stuffer for several years. Joyce's first priority was as a homemaker and Mom, and "she was really good at it." Surviving are: husband of 65 years Philip; three children, Dawn (John) Tuohy, Philip (Lynette) Cook, Charles (Stephanie) Cook, all of Grand Blanc; grandchildren Eric (Katie) Cook, Brad (Carly) Cook, Tori Stokes, Nick (Casey) Cook, Chad Cook, Luke Cook; great-grandchildren Emmett Cook, Parker Cook, Sloan Cook; sister Doris Stievenart; several nieces and nephews. She was preceded in death by her parents; and siblings, Wayne Wheeler, Navola Jean Southwell, and Benjamin Wheeler. Tributes may be shared at www.sharpfuneralhomes.com. To send flowers or a remembrance gift to the family of Joyce J. Cook, please visit our Tribute Store. "Email Address" would like to share the life celebration of Joyce J. Cook. Click on the "link" to go to share a favorite memory or leave a condolence message for the family.